Today, Matt Halloran and guest Karim Rashwan from Advisor Stream discuss the growth of Advisor Stream and how the digital age is an important outlet to grow you practice. Linkedin, Twitter, YouTube, and Facebook to name a few are the newest tools to take you to the next level. Karim dives deep on digital marketing and the scalability of this digital age for advisors and how you can execute properly and keep up with the times! 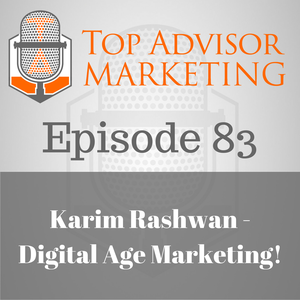 Tune in to meet Karim, and how you can grow your practice with digital marketing!